WHAT A BEAUTY!! FROM THE MOMENT YOU WALK THROUGH THE DOOR YOU HAVE A SENSE OF WELCOME HOME ! THIS INCREDIBLE 4 BEDROOM WITH STUDY TRIPLE SPLIT FLOOR PLAN IS SO WELCOMING, YOU'LL WANT TO SET DOWN, GRAB A COFFEE AND RELAX!! THIS HOME FEATURES THE EVER-POPULAR GREAT ROOM LAYOUT AND IT IS HIGHLIGHTED BY 13 FT COFFERED CEILINGS! TOPPED OFF WITH AN EXTREMELY PRIVATE BACKYARD OVERLOOKING MATURE LANDSCAPING AND A BEAUTIFUL POND VIEW!! THE KITCHEN ADORNS WHITE CABINETS (YES, WHITE!) WITH SOLID SURFACE COUNTERTOPS AND PLENTY OF STORAGE/PANTRY SPACE ALL OPEN TO THE SURROUNDING GREAT ROOM WITH GORGEOUS FRENCH DOORS EXITING TO THE POOL AND SCREENED LANAI. THE MASTER SUITE IS EXTREMELY SPACIOUS AND OFFERS HIS AND HER CLOSET SPACES PLUS A ROOMY MASTER BATH WITH DOUBLE BOWL VANITY, GARDEN TUB AND SEPARATE SHOWER. THERE ARE THREE ADDITIONAL BEDROOMS (FRONT AND REAR) ON THE OTHER SIDE OF THE HOUSE WITH AN ADDITIONAL 2 FULL BATHROOMS. OTHER NOTABLE FEATURES INCLUDE NEWER FLOORING THROUGHOUT, STAINLESS STEEL APPLIANCES, WIRING FOR SURROUND SOUND, ALARM SYSTEM, UPDATED POOL SCREENING, NEW INTERIOR PAINT, NEW BATHROOM VANITY... ALL OF THIS AND ITS ON A CUL-DE-SAC HOMESITE!! TREMENDOUS PRIDE OF OWNERSHIP IN THIS HOME! ITS OBVIOUS THE SELLERS HAVE PUT A LOT OF LOVE INTO THEIR HOME!!! DON'T WAIT ON THIS ONE! 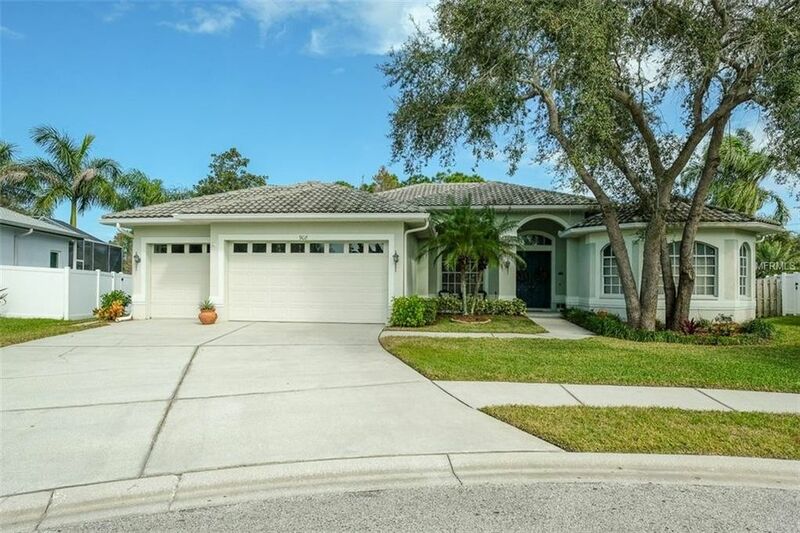 THIS WONDERFUL SAFETY HARBOR HOME COULD BE YOURS TODAY!! Directions: FROM MCMULLEN BOOTH, HEAD EAST ON ENTERPRISE, TURN RIGHT ON GREEN SPRINGS DR., TO STOP SIGN AT MARSHALL ST., LEFT ON WYNGATE INTO HUNTINGTON ESTATES, IMMEDIATE RIGHT TO ADDRESS.